EasyShop - W2LIE.net | Monitor Long Island, Inc. Thank you for visiting our shop online. Digital downloads are delivered to the e-mail address on file with your PayPal account. All purchases must be made through PayPal (they accept credit for those of you with out PayPal Accounts. If you have any questions about our products, or need assistance, please feel free to e-mail us. 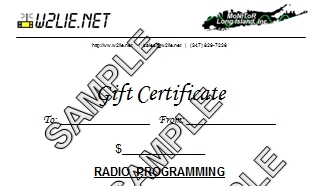 Monitor Long Island now offers Gift Certificates. Certificates are e-mailed to the purchaser within 24 hours of purchase. Files to program your radio using BuTel Software.